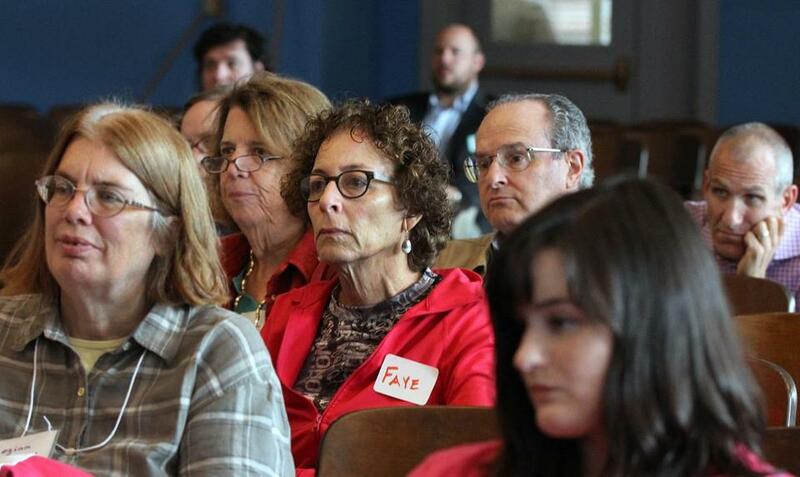 More than 100 residents and activists attended a forum on student housing in the Allston and Brighton neighborhoods. More than 100 residents of Allston and Brighton spent Saturday morning at a community meeting, hoping to find solutions to the strain placed on parts of their neighborhoods that are increasingly populated by transient students. The area has “experienced a steady change,” said John Cusack, 50, who grew up in Brighton and has three children in local schools. Saturday’s forum has been in the works for a few months, in part inspired by the Globe’s Shadow Campus series, which explored the risky and exploitative practices in Boston realty that led to the death of a Boston University student last spring. Discussion was robust and largely positive at the event, organized by the Allston-Brighton Community Development Corporation at the Boston Green Academy in Brighton. Few of the attendees were college-age. “We have so many young people here in Allston-Brighton, who are such an incredible resource,” said Carol Ridge-Martinez, executive director of the Allston-Brighton CDC. Liza Padgett, 29, and her housemate, Liam Walsh-Mellete, 22, saw the forum as a chance to engage with their new community. They have lived in a housing co-op in the GAP neighborhood — so named for the parallel Gardner, Ashford, and Pratt streets — for one year. According to Padgett, young adults, particularly college students, aren't necessarily committed to their temporary neighborhoods. Allston and Brighton houses are largely investor properties occupied by temporary tenants. 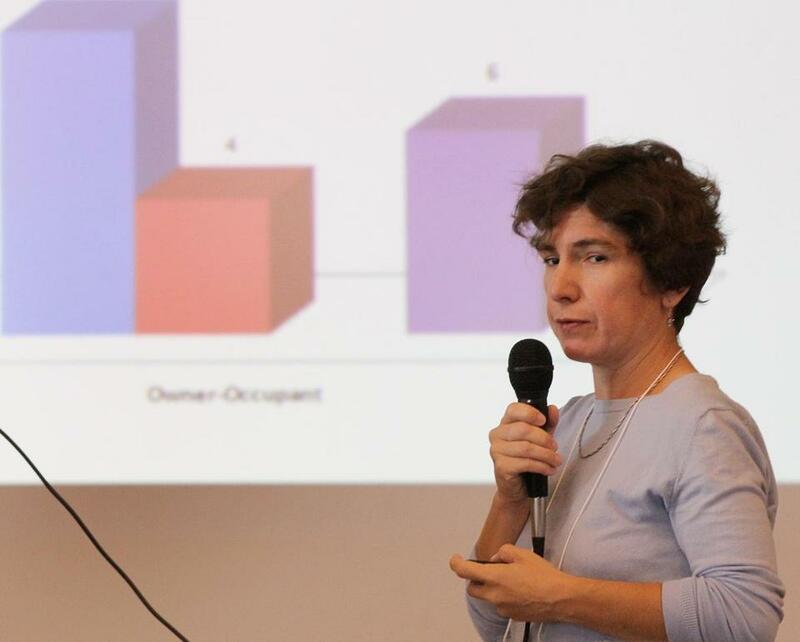 According to Valerie Frias, associate director at Allston-Brighton CDC, the percentage of housing in the area occupied by someone other than the owner rose from 68 to 75 percent over the last two years. Valerie Frias of the Allston Brighton Community Development Corporation addressed the forum. Representatives from the mayor’s office, the Boston Police Department, the Boston Redevelopment Authority, and other government bodies attended and participated in smaller group sessions. The Walsh administration plans to release a new housing strategy within the next few weeks, according to Sheila Dillon, chief of housing and neighborhood development. It will include plans to address the need for housing that is affordable to the middle class, as well as a student housing plan, Dillon said. Of the approximately 150,000 college students in Boston, about 36,000 live off-campus at 13,000 addresses, Dillon said. The student housing plan will include goals for additional dormitory construction and stricter enforcement on overcrowding and code violations. Boston College was the only university to send representation to the forum. Many wanted to ensure that privately contracted dormitories would still be paying appropriate taxes. If universities are to expand housing options, event participants said those dormitories should be regulated, supervised, affordable, and accountable to the university. Other topics addressed in the discussion groups were neighborhood stabilization strategies, BRA processes and its role, and code enforcement and quality of life. Absentee landlords who ignore code violations and don’t regulate tenant behavior were called a significant problem. Sharon Cayley, 67, bought her condominium 22 years ago. “One-quarter of the units are owner-occupied,” Cayley said. There are at least a dozen new people a year in the building, prompting long-term owners to feel as though they juggle “baby-sitting and policing,” she said. Noise and cleanliness issues were points of contention for many community members. “Some of my neighbors have been sleepless for years,” said 84-year-old Louise Bonar. Bonar has lived in her home since 1963, one street away from Boston College’s campus. Boston police have been working within the community for the past three years on a new policy for handling fallout from raucous student-hosted parties. Parties broken up by the police used to end with arrests, arraignments, $100 fines, and permanently tarnished records for those involved, said Boston police Sergeant Michael O’Hara. This program offers tenants the choice between a court arraignment and 30 hours of community service in the Allston and Brighton neighborhoods, carried out under Boston police community service divisions. The new policy underscored the tone of Saturday’s forum. College students were welcome for what they offer the community, but long-term residents are navigating the pitfalls of rising rents and louder neighborhoods. Correction: An earlier version of this article incorrectly identified the school close to Louise Bonar’s home. She lives one street away from Boston College.